The Advanced Fast Reactor (AFR) is a fast-spectrum, sodium-cooled, metal-fueled, pool type reactor. It is being developed by building upon the extensive Argonne experience on sodium reactor technology and on the fuel cycle based on pyroprocessing of spent fuel. Argonne gained extensive experience with the operation of the Experimental Breeder Reactor II (EBR-II). By using some of the main EBR-II characteristics, the AFR is being developed on the basis of proven technology. The AFR baseline design size has been selected at 800 MWth (approximately 300 MWe - AFR-300) to allow for modular construction and deployment and for scalability of the main EBR-II components. While the basic features of the EBR-II design are being used in the AFR, specific improvements are being made and alternative design solutions are being evaluated, including options intended to lower the construction costs. 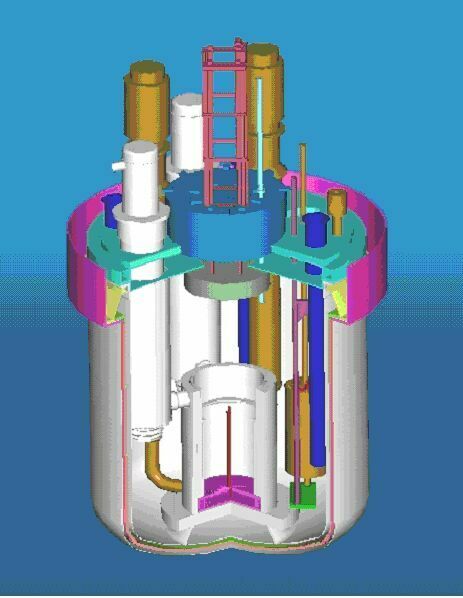 Among the main areas of study are the power (size) of the reactor, maintainability of components inside the primary tank, and the containment design. The reactor core is being designed for using metal fuel and providing inherent safety characteristics. Coolant circulation through the core is accomplished with a loop immersed in the sodium pool. This allows forced flow through the core and intermediate heat exchangers during operation and facilitates passive cooling by natural circulation when the primary pumps are not available. The primary sodium pool is essentially isothermal (at the low, reactor inlet temperature), which provides a large heat capacity that allows for ample response time in multiple transients. The primary sodium tank and its cover are exposed to a uniform temperature, thus reducing thermal stresses and ensuring a long design lifetime. To reduce refueling outage length, restricted fuel handling (transfer of the fuel in and out of the primary tank during reactor operation) is allowed by the design. This feature incorporates fuel storage (storage basket) in the primary tank. Access to any location in the core is accomplished with two rotating plugs. Full automation of the entire fuel transfer sequence is planned. The AFR system is being developed to meet future energy (electricity production) needs, but it can additionally support specific missions that range from actinide burning or management in the short term to actinide creation for longer-term resource sustainability. In carrying out these missions, the AFR system can meet the goals generally established for advanced nuclear energy systems: sustainability, safety and reliability, and economics. The sustainability goals focus on fuel utilization, waste minimization and proliferation resistance. The AFR system based on the electrometallurgical process offers great potential for meeting these goals because of its closed fuel cycle with co-located facilities, actinide consumption and spent fuel processing without separation of plutonium. In order to meet the economic goals (low deployment costs and marketability) the AFR development philosophy will emphasize cost reduction by use of modular construction and by simplification of the design. In the area of reliability and safety, simplification and passive safety design, based on the extensive, 30-yr operational and safety experience with EBR-II, will ensure the AFR-300's excellent potential to meet the design and performance goals of advanced nuclear energy systems.